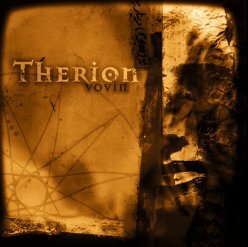 Although an excellent album, Theli, Therion's previous album (not including the cover/soundtrack recording A' Arab Zaraq: Lucid Dreaming), was not really the classical-metal magnum opus that many expected it to be. That was due in large part to the sometimes out of place 'death' vocalization and cheesy production. The overuse of synthesizer and keyboard indicated that their vision was larger than their resources could facilitate. I am happy to announce that all these problems have been utterly decimated by way of Therion's latest album, Vovin. This recording is absolutely immense. Therion songwriter/visionary Christofer Johnsson has a full orchestra and a choir at his disposal, providing the album with a more 'natural' sound, as opposed the somewhat artificial sound of Theli. The album has only one passage in which normal vocals are used, the vast majority uses only operatic vocals, giving the album more continuity and blending well with the orchestration. The music, although not terribly complicated, is well developed and arranged, varying tempo, aggression and melody nicely. Although many within the metal community may accuse Therion of pretension and arrogance, I think what they are doing has great merit. Therion has done a great job of introducing classical music into a modern format. This is a totally unique and essential gem of modern metal.